This is actually a long story, but I will try to keep it brief. Back in late 2003, I began playing with ESX 1.5 in a home lab for my own personal education. At the time I was a business analyst working for the office of the Executive Vice President at PC Connection in NH, helping create a new custom application for the sales team. However, I really wanted to work in the IT department. I started to learn as much about VMware and virtualization as I could as part of the project. Once the project needed to move into implementation I saw my opening to pitch the use of VMware. I also knew that nobody in IT at the time even heard or it, so I ended up being the VMware expert and was moved into IT to run the implementation of the systems. I deployed PC Connection’s first groups of clusters on IBM hardware and storage with good success. At the time we were one of very few companies using VMware 2.x in Production at the time and we were a great story for IBM and VMware. I’d like to say it was for career advancement, or recognition, but really the main reason was personal growth. As a VMware PSO employee at the time it was harder to find the time and the support from some managers back then to take the tests, let alone the defence. Like many things I do in my life, I do them just to see if I can and to help myself grow to a new personal level. It’s a challenge to myself to learn new things and VCDX was one I wanted to see if I could get. I simply wanted to be one of the first people in VMware PSO to achieve the certification and my mission was accomplished. This for me took almost 2 years. I started the process by taking the original tests once they were released. Getting support from managers as a PSO person on delivery engagements was always a challenge, but there was also delays in the early stages of the tests and defences. Once I passed the tests, there were not many defences available to get into at first. I think I recall there only being ones at PEX and VMworld at that time. If memory serves there was not any outside of corporate events like the big two. I also think the limited spots were being given to VMware employees at fist in order to get the word out on the program for non VMware people. Travel budgets and other restrictions got lifted and finally made it possible at Partner Exchange in Las Vegas. I think the best advice I can give is like any challenge, do it for you. Not for you’re company, your boss, the hope of a raise, or jumping ship with a shiny new certification to get you a new job. If you go into it with goals that are not for personal growth, it’s not going to be fun or rewarding. 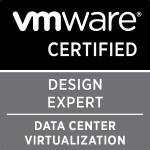 You should WANT to get your VCDX, you should not feel like you HAVE to get it. The other things may or may not come, but nothing is ever guaranteed except personal satisfaction. Prepare for the defence properly. It’s a conversation between you and the panel. It’s not a grilling session of you by them, or a 90 minute PowerPoint by you. Have fun with it and I say these days, enjoy the journey. I think the best part for me was the defence itself, and that is where most people freak out. I actually had fun talking about the solution and admitting where things were not really great in the design. Those areas gave me talking points for the panel. No design is perfect, you should admit where you made mistakes, and why they may have been bad decisions. Lastly, too many people worry about the names of the panellists and who they will get. Don’t worry about it, frankly it does not matter who you get on your panel. I’m not sure really. I passed the defence on the first attempt, so I really have nothing to look back on and change. Personally the written exams are tough for me. If I could change anything it would be to study for those more. Even today I have trouble with the exams to maintain my upgrade status. I cannot even say I’d want a different group of panel members as a joke. I liked having both Frank and Duncan in the room for my defence. We have all three been friends really ever since and found mutually newfound respect for one another. My journey led to many projects with both of them. I can’t say I’d personally change anything, I’d do it the same a second time around. Trick question since I work for VMware. At the time it was so new and not well known so there was not much response to be honest. I think now as people pass it there is more visibility to it, so there may be more recognition internally. For me being #37 and the fact it was so new made it hard for people to understand what it meant. Life is the same as it was before for the most part. I’d say it was worth it for my personal growth like anything else I do, but for me it has not change anything in what I do or how I do it. Back then I wish it had more recognition, but as they say, it is what it is. Categories: VCAP, VCDX, Virtualisation | Tags: VCAP, VCDX, VCDX5, Virtualisation, virtualization, VMware | Permalink.